Scott McCloud defines comics as “juxtaposed pictorial and other images in deliberate sequence” in his book, Understanding Comics: The Invisible Art. 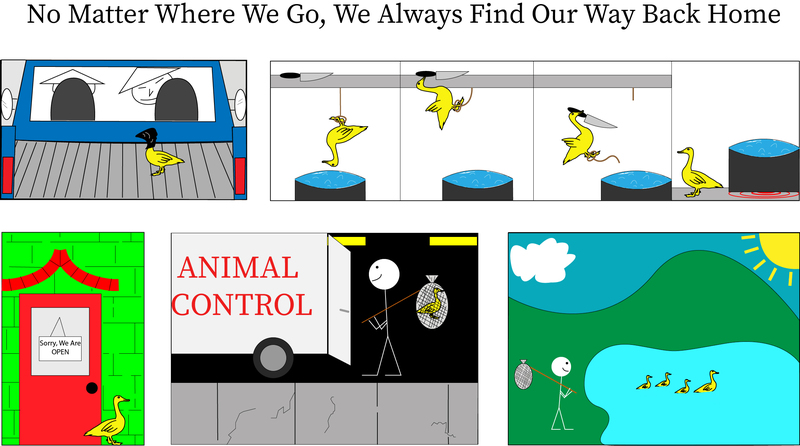 The comic I created, No Matter Where We Go, We Always Find Our Way Back Home, fits the definition perfectly. The comic is made of pictorial images (frames) that are separated from each other to indicate the change of the scene and setting to show contrast between each other. In the second frame, lines are used to separate the sub-frames to indicate that the scene setting is the same, and to show more detail of the duck’s escape to help the reader be able to understand he’s escaping by seeing the step-by-step process he used to swing himself, grab the knife, and cut himself down to avoid falling into the boiling pot of water. The “other” images that were used are textual character images used in the third and fourth frames to help the reader understand the setting of the scene and what is happening exactly. Without these words, we wouldn’t know the kind of building the duck is standing outside of, nor the purpose of the truck. I intentionally created the comic to be read from left-to-right and top-to-bottom, and it is obvious that the comic should be read as so. Some of the concepts from McCloud’s book that the comic follows are using color to paint the picture and help interpretation of each scene, different sizes of frames in which I fit the frame to the scene, not the scene to the frame to make it easier to define the setting, and keeping it simple and not over complicating it with too many lines or unnecessary background detail. I believe the ideal reading environment for my comic to be read digitally on a screen, being read from left-to-right and top-to-bottom. I would like the comic to fit whole on a screen with no need to scroll, being read from left-to-right and top-to-bottom. It then gives the reader the option to zoom in to see more specific detail to understand each frame better, such as the lines on the bag indicating that the duck is captured in a safe netted trap that doesn’t harm the duck. I understand that the comic could be seen as insensitive, offensive, and stereotypically racist due to the use of Asian hunters capturing a duck and trying to cook it at their Chinese restaurant, especially with the squinted eyes and the rice hats. Although, I don’t intend for it to be taken that way. I used the eyes and the rice hats because those are common ways for people to identify the hunters as Asian, making it easier to understand the context. Duck is one of the more eaten meats in the Chinese culture. I used the bag over the duck’s head to make it less gory and safe for most ages to read without discretion. Also, I have a Chinese friend whom owns his own restaurant, and that’s what I designed the exterior of the restaurant in frame 3 after. I understand that I could’ve used normal stick figures with dots-for-eyes, but I wanted to add more detail and culture into the comic, especially since I help my friend hunt duck for his restaurant (and personal use). It relates more to personal experiences, and not to mock the Asian/Chinese population. I want the readers to read in with a basic understanding and without thinking in an abstract way which could understandably result in someone seeing it as offensive. The point of the comic is that even though the duck is taken away from his family, he goes through a rough adventure, and eventually makes his way back to his family and his home. The duck is accepted back into the family even after coming into human contact, which indicates the love his family has for him. He goes through the adventure and the struggles to show that with true desire and resilience, one can make it home back to their family and cherished ones.